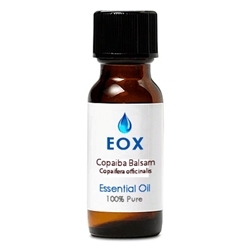 Copaiba Balsam oil is known for its honey-like notes and offers a completely unique woody, faintly balsamic, slightly spicy-peppery aroma. Copaiba balsam oil is made from the bark and oleoresin collected from the trees of the Copaifera genus. This oil has been is mostly utilized in the fragrance industry, and is known for some skin care applications. A colorless to pale yellow liquid with a sweet, woody-spicy, slightly musky scent. It blends well with cedarwood, citrus oils, clary sage, jasmine, rose, vanilla, ylang ylang. Avoid contact with eyes and mucous membranes, as the resin can act as an irritant. Those sensitive to the resin may experience a measles-like rash accompanied by irritation, itching and/or tingling. Discontinue use if these effects occur. Just received this oil a couple days ago. Several online articles say it can be safely taken internally for pain, inflammation. There are also many studies available showing this oil is equally effective as a pain killer as medication, narcotics that cause unlimited number of side effects. My arthritis hurt so bad yesterday, I had to give it a chance. I read more about it and increased dosage. Now, I'm not totally pain free, but I can say its working better than NSAIDS I have used.